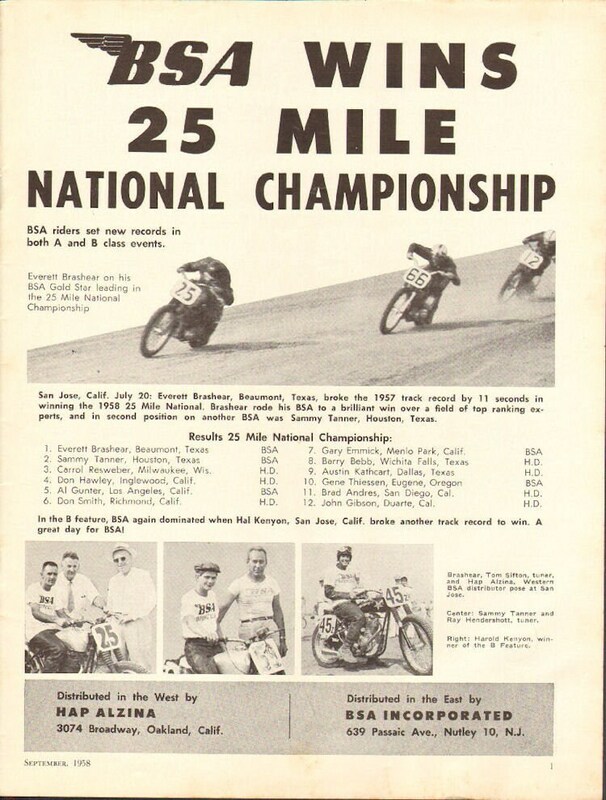 Everett Brashear on his BSA Gold Star leading in the 25 Mile National Championship. San Jose, Calif. July 20: Everett Brashear, Beaumont, Texas broke the 1957 track record by 11 seconds in winning the 1958 25 Mile National. Brashear rode his BSA to a brilliant win over a field of top ranking experts and in second position on another BSA was Sammy Tanner, Houston, Texas. Photos include: Brashear, Tom Sifton, Hap Alzina, Sammy Tanner, Ray Hendershott, Harold Kenyon.